Hi! Welcome. In a little over a week, on June 12th, I’m celebrating the re-release of my novella, FAST Balls. In this book I do something I’ve only done once or twice in my books – I redeem a villain. It’s hard work – but it’s fun! First let me say that some authors may plan out their series so thoroughly in advance that they know that a villain will later be a hero. I’m not one of those authors. LOL. When a villain steps up and asks for his own romance, I start off skeptical – but I can be persuaded. In Tackling the Tight End, for example, I redeem a guy who was really bad in the first book in the series, Outing the Quarterback. Similarly, in FAST Balls I make a hero out a dude who we really love to hate in an earlier book in the Balls to the Wall series, Fire Balls. Interestingly, you don’t have to read Fire Balls first, because you get to see my former villain being bad in this book, so you understand how far he has to progress to be a real hero. That’s the thing about villains. While in their villainous deeds, they’re the heroes of their own stories – they aren’t the heroes of ours. So to redeem them, we have to be able to explain why they did the things they did to the reader’s –and the other lover’s – satisfaction. And it better be good! The more horrific we can make the cause, the more heroic the villain can become. Then, of course, the villain has to step up and show his true heroic nature. Once again, the more valorous the better. While a regular old hero may get points for just being cute and funny, a redeemed villain is going to have to impress us more than that. My redeemed villain in FAST Balls is in his 20s, so much bad stuff can be laid at the door of his parents – and that’s where it’s piled deep and high in this story. His father is a very bad dude and we understand how our newly minted hero got to be the way he is. N addition, he’s a firefighter so he has many great opportunities to prove what a brave and good man he can be. 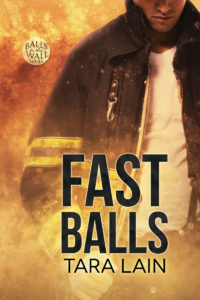 If you read Fire Balls, you may be surprised to see this hero, but I hope you love him – and that you enjoy my firefighters-in-love romance, FAST Balls. You can pre-order it everywhere now. Read an excerpt HERE.